BOCHUM, Germany and YEREVAN – JANUARY 7, 2016— The year 2015 has come to an end, and in both East and West the centenary of the genocide, often denied, has been commemorated. 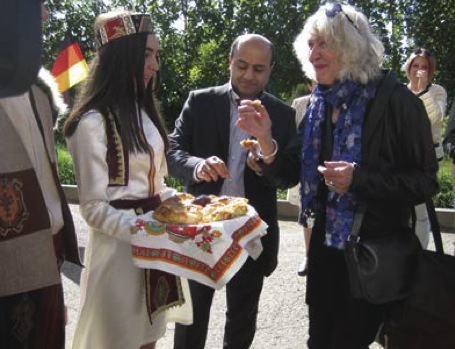 This unwavering confidence expressed by the daughter of two genocide survivors inspired me to dedicate three years to reading and writing about the fate of the Armenian people and to introduce Armenian culture to my region, a region where German steel production flourished in the 19th century – and with it, the industrial production of modern weapons in Germany. Where did this weapons production lead us? That is well known. But birds speak a different language. In October 2015 I flew to Armenia together with my Armenian travel companion, the historian Azat Ordukhanyan, to plant the third Armenian-German Friendship Garden that year in Jeghegnadzor, an old university city near Noravank, the famous jewel of medieval architecture in the mountains. The Friendship Gardens enjoy the sponsorship of the President of the German Bundestag (Parliament) Prof. Dr. Norbert Lammert. The German beech, juniper and pine trees were donated by German friends and flown to Yerevan via Moscow, together with earth and roots in a carton, and from there picked up by Armenian friends in their car. Helpers dug, planted and watered the young trees in the presence of the mayor and numerous photographers, and I watched as Armenian oaks were planted next to them – in front of the monument commemorating the victims of the war in Berg Karabach. After this had been done, we proceeded to the city’s school where German is taught as the first foreign language. The sight of the children moved me deeply. Dressed in black trousers and skirts, white shirts and blouses, the boys and girsl stood shoulder to shoulder. Their eyes glowed and they waved German and Armenian flags. Two of the students dressed in traditional Armenian apparel served the guests bread and salt, and we broke off pieces of bread and dunked them in the salt. My hand was trembling and only later did the line from Sevak’s poem “Freedom“ come to mind: “Truly,/ You are like salt.“ Then, first the German, then the Armenian national anthems rang out in the school yard, the director delivered a speech and the children recited poems by Heine, Goethe, Schiller in excellent German. After that came an Armenian and a Tyrolean dance. The performance by the students ended with a battle song from the resistance 100 years ago. Then came the picture-taking. One photo after the other, small and large, and conversation did not want to end – around a table decked out with a wealth of delicacies. In the afternoon about forty people came into a classroom to attend a presentation of the new German translation of poems by Parujr Sevak, “Parujr Sewak – Und sticht in meine Seele – 24 und 4 Gedichte Armenisch-Deutsch”, translated and published by Agapi Mkrtchian and Heide Rieck. Azat Ordukhanyan introduced the event in Armenian and five poems (‘Sand a Leopard,‘ ‘Freedom,‘ ‘One of us,‘ ‘Dying,‘ ‘We are few but We are called Armenians‘) were presented in both languages. In the following discussion on the art of translation, one German teacher said, with respect and astonishment, that she had never been able to imagine that it would ever be possible to hear the spirit of Sevak’s poetry flow into the German language. She said she had goose pimples during the recitation. The following day a group of tourists from Thuringia, accompanied by a guide named Ararat, visited our new Friendship Garden and a tree from Thuringia was planted. Following animated discussion over coffee, we took our leave. The tourist group was off to Berg Karabach. Azat and I drove with friends towards Yerevan, to visit the Paruyr Sevak Museum in Sangakatun (formerly: Chanachchí) and to plant a rose bush from Germany in front of the house where the poet was born and lived. It was a Sunday. To my amazement, a group of students with two teachers came towards us as we mounted the stairs leading to the monumental gravestone of the poet in a magical fruit garden. As the friendly museum guard explained the purpose of our visit to the children, they ran excitedly back, in order to help with planting my rose bush. Each of them held an apple or a pear in their hand — from the trees that the poet himself had planted — a gift that certainly they will never forget: not far from Berg Ararat an apple from a poet’s tree awakens in the heart of children the love of poetry! This, too, is Armenia. In the showcase of the museum, where Sevak’s works in various languages are displayed, now one can also see the new volume of 24 plus 4 poems in Armenian and German. My Sevak apple sated my appetite in the hotel, but the nut from his garden I shall cherish in my treasure chest at home. The road towards Yerevan bends in wide curves. Soon, just before a curve, we recognized a sign with the name of the town, “PARUYR SEVAK” and on the other side of the street, a memorial stone to commemorate the death of Armenia’s favorite poet on June 17, 1971 in a mysterious automobile accident; he was 47 years old. In silence we rode into the evening, Ararat in front of us, so close and clear were its white peaks, and before the darkness was to envelope us completely, the sky glowed in red-blue-orange, as if for us alone. Before my flight back to Germany, Azat and I laid flowers down in front of the eternal flame for the victims of the genocide. The groups of visitors had dispersed. We stood alone in the circle of tall steles that recall the 17 provinces of Western Armenia, from which the Armenians were expelled 100 years ago and sent on death marches. And see there, perched atop a monumental stone, two doves looked down on us below. As in a dance, they circled each other, pecked and then stood still again — in their white feathers. In the plane I thought about the trees we had planted and those that Azat would soon bring from Yerevan for the fourth German-Armenian Friendship Garden — to Dortmund, in Germany’s largest botanical garden — and thought back to the numerous cherished encounters — in Yeghenadzor, in the German Club in Yerevan with students and to the several hospitable tables, where we even danced. I also thought about the cranes that trumpeted above us on November 9, 2014, after Azat and I had discovered Armenian names in a memorial volume for the forced laborers buried at the Bochum main cemetery. Thousands of cranes, circling above us and flying off to the south, Souls of the Armenian ancestors.